Every kid loves superheroes and legos; put those two things together and you get an instant hit for anyone who likes either one of those things. This game however does not only appeal to the young generation, but instead it aims for a larger audience including anyone who ever got in touch with legos and grew up watching their favourite superheroes on screen. Lego Marvel Super Heroes is about your favourite heroes fighting the bad guys, which is enough to capture the attention of any marvel fanatic as the cast of heroes and villains alike is enormous. There is a story about Galactus wanting to eat Earth and sending the Silver Surfer to prepare it, but his board will soon be destroyed and from there on the story focuses on the villains trying to acquire the Cosmic Brick, pieces of that board, and the heroes trying to stop them and in the end prevent our planet from being destroyed. With that being said the story isn't exactly the most original and captivating one, but the way it's handled, from the small jokes to the references and the open world where everything is possible as you can see Spiderman fighting alongside The Avengers and even more weird combinations of superheroes and villains which each have their own side story and quests, something that can only be done in an open world environment such as this, where the little stories you make along the way will mark you more than the overall Galactus taking over the world plot. 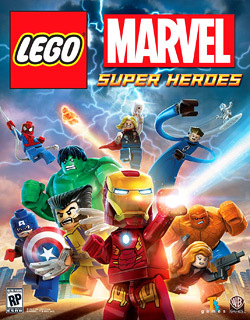 If you have played a lego game before, the way this title plays is almost no different from any other lego video game, and even thought there are some changes here and there, Marvel Superheroes does not come without its frustrating moments. For example the camera control can be an absolute disaster at times as I had to switch to my other character just so I can get a camera angle from which I would be able to see where my previous character should go. The flying mechanic is no different as once you gain enough momentum you'll be speeding so fast you won't be able to take a turn in time to avoid a building, which can become frustrating at times. Otherwise the game runs pretty smooth and this being a lego game you don't have to worry about controlling different characters with different sets of abilities and movements because once you know how to control a character all the others who have similar powers will control the same and the fact that you can't die helps reducing the frustration you usually get while playing video games, without taking away the feel of challenge as there are plenty of things standing in your way. There are plenty of things to do and see in Marvel Super Heroes as the entire world is populated with characters, landmarks and sidequests combined with some jokes and puns that will make you smile along the way. First of all this is a lego game, so everything around you will obviously look like legos, but comparing it to the lego games that came before it, this game definitely feels like it took a step forward, mostly because the scale of its open world makes this game feel like an authentic environment for the Marvel universe. The unique art style of those lego games is what makes them look unique and beautiful even in the years to come when a new generation will arrive, and since this looks and feels like legos, this might just save you some space in your room as well as money spent on actual legos. Lego Marvel Super Heroes is only the fourth game in the series to have voice acting and this Marvel mash-up surely gets the best of it; while the silent humour can be effective at times, for most of the situations speech is a much needed addition to deliver those corny puns and jokes with full impact. The sound effects are pretty good, but nothing really stands out or takes you out of the experience, as on the contrary, the game helps you by pointing out with the use of a specific sound that you can use certain bricks to build something useful, but even so those effects will wear their magic in time. There is a total of 15 mission in the main campaign, but after completing those you will earn access to the Free Play mode where you can take on each mission and play it with different characters in order to unlock everything. Aside from that in New York you can find 12 more side missions, which might not be as big as the main ones, but they are still fun to play and just like in any other open world game of sort you can help citizens or heroes with their tasks in order to achieve the 100% completion mark and unlocking every single character this game has to offer while doing that. As the list of available characters consists of around 150 heroes and villains you will be busy for quite some time if you're willing to unlock everything the game has to offer. I picked up this game because I was a fan of Marvel cartoons as well as legos as a kid and this game is exactly what I wanted to play, a game that does justice to these heroes who had some bad or mediocre games before. This game nailed the genre and understood its source material and its audience at the same time, knowing exactly what to deliver for the audience they wanted to hit. This is far from being a perfect game, but if you're a fan of Marvel heroes, this is among the best titles starring your favourite superheroes you can get to play for now. If you loved the cartoons, the comics or the movies you should pick this game up as for anyone worrying about the lack of content, this title has more than enough to keep you busy for a while.